John Daly accepts a grant award from ME on behalf of The Friends of Pheasant Branch Conservancy. The Middleton Endowment Committee (ME) awarded grants of $700 each to the Alzheimer’s Association of South Central Wisconisn, Gio’s Garden, Middleton Youth Center, Middleton Police Department, and Friends of Pheasant Branch Conservancy as part of its 2018 fall cycle. The grants were announced at the Middleton Chamber of Commerce’s monthly Get Moving Middleton breakfast meeting at the Hilton Garden Inn on Thursday, Dec. 6. Alzheimer’s Association plans to use the funds for The Music & Memory Matinee on June 12, 2019. The afternoon concert also involves the Friends of the Middleton Performing Arts Center. The Larry Busch Band will play songs ranging from big band to early rock. Gio’s Garden, which is a therapeutic respite program for children with special needs who are 6 and younger, plans to host five parent support groups from January to June, providing parents and caregivers the resources to network with one another to increase their personal well-being. Middleton Youth Center, in collaboration with UW Community Arts, has developed a new project called Whooopensocker. The creative arts residency program led by UW-Madison professor Erica Halverson aims to engage middle school students in the creating and sharing of ideas through writing, improvisation and devised performance. The hour-long sessions will go for 12 weeks and culminate with a vaudeville-style performance of student stories. Middleton Police Department plans to use the funds for a new “dual purpose” K-9. The K-9 will be involved with community relations, office and citizen safety, tracking, evidence location and narcotics detection. Officer Howard Statz will lead the new K-9 program.</p? The Friends of Pheasant Branch Conservancy, along with Northside Elementary and Attic Angel Place, will host an intergenerational art project in February 2019. The funds will help with bus transportation for students and teachers to Attic Angels Place, art materials, postage, publicity and display materials. FOPBC did a similar project in 2014 with Sauk Trail Elementary. 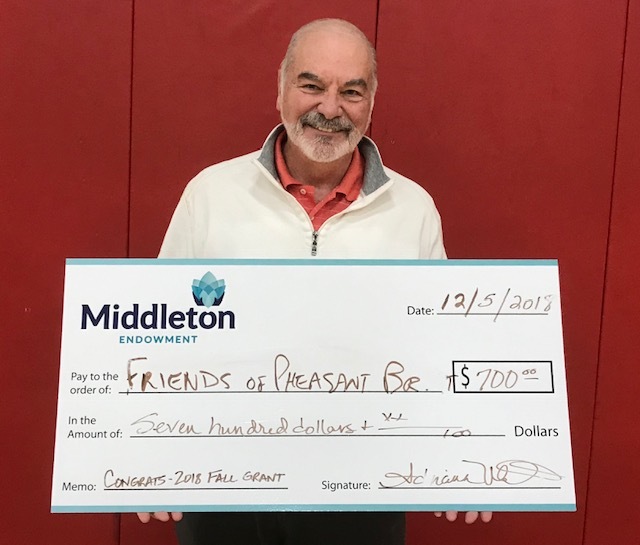 Gio’s Garden, Middleton Youth Center and Friends of Pheasant Branch Conservancy have each previously been awarded grants by Middleton Endowment. ME was formed in 2007and has awarded more than $55,000 in grants to nearly 50 organizations. The ME Advisory Committee usually considers grant applications twice each year. ME typically awards grants in the $250 to $1,000 range. Besides Machina, other members of the advisory committee include vice chair Shayna Borakove, Nicole Broyles, Dan Chart, Curt Fuszard, Perry Hibner, Ryan Mauer, Mark Opitz, Deb Saeger and Scott Schwendinger. Senior Nicholas Lindberg receives the 2018 Middleton Endowment Scholarship from board member Perry Hibner. Middleton High School (MHS) senior Nicholas Lindberg was named the recipient of the Middleton Endowment (ME) scholarship. 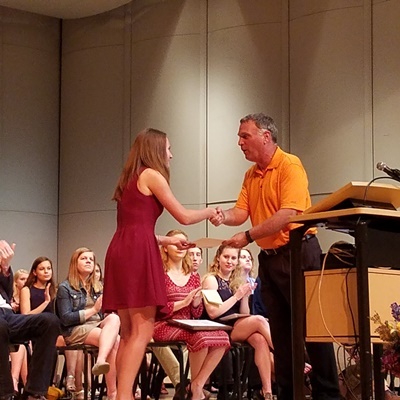 The scholarship was one of nearly 80 presented during the annual Middleton-Cross Plains Area School District (MCPASD) Scholarship Night at the Performing Arts Center on Wednesday, May 16. Nearly $77,000 in scholarships were awarded. MCPASD Director of Communications and ME board member Perry Hibner presented Lindberg with a $500 scholarship. A committee of MHS staff members selected Lindberg based on criteria provided by ME’s board of directors. Lindberg played for years in the MHS boys hockey program and also played golf and ran cross country at MHS. He had extensive civic and community involvement, including serving on a mission trip to Blackfeet Indian Reservation in Montana, serving meals to the homeless, coaching youth hockey, and participating in Feed My Sheep’s annual food packaging event. The mission trip in the summer of 2017 had a profound impact on Lindberg. The reservation is one of the poorest in the United States with high levels of alcoholism and suicide. Lindberg plans to attend the University of Tampa and major in international studies. After graduation, he would like to get involved in humanitarian work. ME has been awarding one scholarship to a graduating senior annually since 2016. The organization is also hosting a Summer Sponsorship drive. All donors who make contribution of $25 or more between now and September 15 will automatically be listed as a Middleton Endowment Sponsor in its Year-End Annual Appeal marketing materials. The Middleton Endowment Committee (ME) awarded grants to Gio’s Garden, Heathy Community Kitchen and Safe Harbor Child Advocacy Center as part of its 2017 spring cycle. 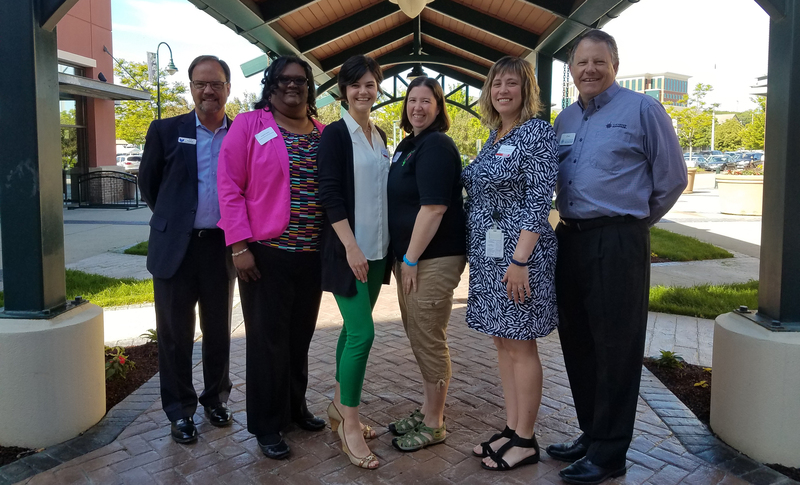 The grants were announced at the Middleton Chamber of Commerce’s monthly Get Moving Middleton breakfast meeting at the Hilton Garden Inn on Thursday, June 1. All three organizations were awarded the full amount that they requested. It is the third time in Middleton Endowment’s history that every grant awarded was for the full amount. Gio’s Garden was awarded $1,000 for an expansion of its Date Night program. The program was implemented in February 2016 so that parents of children with special needs could spend a night out. Fourteen families used Date Night for 163 hours of sibling care last year. The grant will help Gio’s Garden expand the number of families who can use the service. Healthy Community Kitchen was awarded $1,000 for its Healthy Meals program. Meals are provided for free to individuals living 300 percent below the federal poverty level. Last year, more than 3,400 meals were served to community members. The grant will help Healthy Community Kitchen expand its transportation services and also grow more food in its gardens. Safe Harbor Child Advocacy Center was awarded $1,000, which will be used to provide children and families with free trauma assessments after an interview. Last year, 225 children and caregivers were referred to the Safe Step program. ME was formed a decade ago and has awarded more than $48,000 in grants to more than 40 organizations. The ME Advisory Committee usually considers grant applications twice each year. ME typically awards grants in the $250 to $1,000 range. ME is also working with the City of Middleton on a possible community project and special gift as part of its 10-year anniversary, Fuszard said. Besides Fuszard, other members of the advisory committee include vice chair-secretary Adrianne Machina, Shayna Borakove, Nicole Broyles, Dan Chart, Perry Hibner, Tom Johnson, Josh Marron, Ryan Mauer, Deb Saeger and past chair Dan Loichinger. MHS Senior Taylor Ducke accepts her scholarship from ME board member Perry Hibner. The 2017 Middleton Endowment Committee (ME) scholarship was awarded to Middleton High School senior Taylor Ducke at the District’s Scholarship Night on Wednesday, May 17 at the Performing Arts Center. 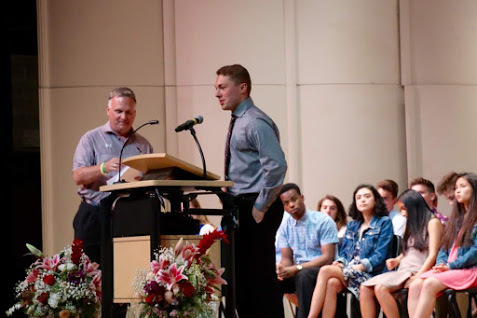 Ducke was presented the scholarship by ME board member Perry Hibner, who also serves as the Middleton-Cross Plains Area School District’s communications director. The ME scholarship recipient was determined by the MHS scholarship committee, which is made up of counselors, administrators and teachers. The criteria established to determine the winner including a student who has been active in service learning and community involvement. Ducke plans to attend UW-Madison and major in human biology. She is a member of the yoga, current events and book clubs at MHS. She has also been active in the Key Club. Ducke has served as a Link Crew mentor for incoming freshmen. She is a member of National Honor Society. She has volunteered on mission trips and as a greeter at Gilda’s Club. She also played four years of lacrosse and golf. ME is an affiliate fund of Madison Community Foundation. Since its inception in 2009, ME has raised more than $150,000 for its endowment fund. ME also awards grants twice a year. The next round of grant recipients will be announced at the Middleton Chamber of Commerce’s monthly Get Moving Middleton breakfast meeting at the Hilton Garden Inn on Thursday, June 1. Besides Hibner, other members of the advisory committee include chair Curtis Fuszard, vice chair Adrianne Machina, Shayna Borakove, Nicole Broyles, Dan Chart, Tom Johnson, Josh Marron, Ryan Mauer and Deb Saeger. Middleton Outreach Ministry's 2016 grant supports facility upgrades. The Middleton Endowment Committee awarded grants to Gilda’s Club, Glacier Creek Middle School, Middleton High School, Middleton Outreach Ministry and the 21st Century eSchool as part of its 2016 fall cycle. The grants were announced at the Middleton Chamber of Commerce’s monthly Get Moving Middleton breakfast meeting at the Hilton Garden Inn on Thursday, Dec. 1. All five organizations were awarded the full amount that they requested. It is the second time in Middleton Endowment’s history that every grant awarded was for the full amount. Gilda’s Club, a cancer support group with more than 2,800 members, was awarded $1,000 to double the number of Grief and Loss support groups it offers each month. The Griefbusters program will also include a six-week curriculum to meet the needs of children who have lost a parent or grandparent to cancer. Both groups are facilitated by a mental health professional and are offered at no cost. 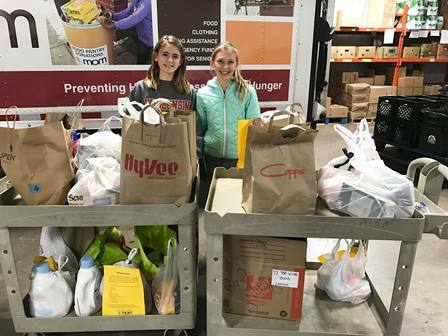 Glacier Creek, a middle school for students in grades 5-8 in the Middleton-Cross Plains Area School District, received $720 to purchase eight break-out boxes. The boxes promote problem-solving, team development and time management skills all while students are learning content in a fun and engaging atmosphere. The boxes will be used in fifth grade although there are plans to use them across all grade levels. The grant was written by counselor Stacy Eslick. Middleton High School, which has nearly 2,100 students and is part of MCPASD, was awarded $700 to purchase two stand-up desks for students to use in physics classrooms. The grant was written by physics teacher Angie Humphrey. Middleton Outreach Ministry, which provides food, clothing, housing assistance, emergency financial assistance and special services for seniors free of charge, received $750 to pay for supplies for a utility room and purchase additional shelving at their facility. The projects will be completed by prospective Eagle Scouts from two area Boy Scout troops. The 21st Century eSchool, an online school for MCPASD students, was awarded $900 to purchase supplies to build a bird blind by the Confluence Pond site. The idea has already been approved by the City of Middleton. The design was developed and the blind will be built by students in grades 4-7 who have called themselves the Elmpact Team. In 2016, ME awarded grants totaling $7,070. Spring 2016 grant recipients were Junior Achievement, Tri 4 Schools, and Clark Street Community School. Since 2009, ME has awarded more than $45,000 in grants to more than 40 organizations.